Today, I attempt to bust a myth related to transaction log files for read-only databases in Microsoft SQL Server. Read-only databases, as the name suggests are databases containing static data. Quite often, applications use read-only copies of 3rd party data, restored in the data-center as read-only databases. For instance, there are services that provide a universal lookup for ISO codes for currencies & countries. Countries and currency codes do not change daily, and it makes great sense to convert the databases to read-only databases. The above statement is incorrect. What is correct is that the transaction log continues to exist – irrespective of whether or not the database is in READ_ONLY mode. What we know for sure is that the log files are not “removed”. Using the undocumented DBCC commands like DBCC LOGINFO and DBCC LOG, I could determine to a fair level of confidence that the log file is not used for some common read-only operations (SELECT, BACKUP). Do you know why the transaction log file is required for READ_ONLY databases? Do let me know. I look forward eagerly to your response. This entry was posted in #SQLServer, Blog, Imported from BeyondRelational and tagged #SQLServer on August 8, 2011 by nakulvachhrajani. The book appears to be incorrect. Changeing DB to Read_only or Read_write will not make logfile dissappear. When we set up T-log shipping we have the option to set DR db to Restore with Standby option. This option allow to restore the T-log backups also DB will be in Readonly mode. Think only DB snapshots will be created without the logfiles. The READ_WRITE/READ_ONLY options describe the updatabilty of the database.In READ_ONLY mode, no INSERT,UPDATE or DELETE operations can be executed. ;Because no modifications are done when a database is in READ_ONLY mode, automatic recovery is not run on this database when SQL Server is restarted and no locks need to be required during any SELECT operations, moreover shrinking the database is not possible”. So , i think there only only an error , “removed” should be replaced by “not used”. 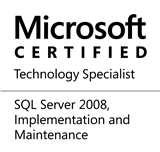 If any of yours is a 2011 MCC, i would suggest him to have a look at Safari ONLINE.He/she should be able to read the pdf of the same book for SQL Server 2008.